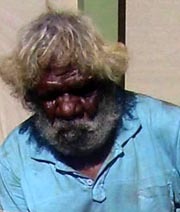 Born at Patjantja in the area of Wilkinkarra (Lake Mackay), Willy belongs to the region of Papunya, Walungurru (Kintore) in the Northern Territory. He is from the Pintupi language group. Willy Tjungurrayi was raised in the bush, naked with only nulla nulla and woomera. He was raised by Charlie Tarawa, who was Willy’s father’s brother. It was Charlie’s camels which eventually brought the family in to Haasts Bluff in the late 1950’s and from there to Papunya. Willy began painting for Papunya Tula Artists in 1976 and has since emerged as one of the senior Pintupi painters. He is the younger brother of Yala Yala Gibbs Tjungurrayi (now deceased), who was a very well-known artist. In the early 1980’s he joined the move back to the Pintupi homelands and now lives with his family in Kintore. Sadly, Willy Tjungurrayi passed away in 2018. Collections: Artbank, Sydney; Art Gallery of New South Wales, Sydney; Flinders University Art Museum, Adelaide; National Gallery of Australia, Canberra; Parliament House Art Collection, Canberra; The Holmes a Court Collection, Perth; The Kelton Foundation, Santa Monica, USA. Selected Exhibitions: 1973 "Warlpiri and Pintubi Art", Angaston; 1981 "Aboriginal Artists of Australia"; 1982 Georges Gallery, Melbourne; 1982, Brisbane Festival, 1982 Mori Gallery, Sydney; 1983 Papunya, Paintings from the Central Australian Desert, touring exhibition, America and Europe; 1985 "Dot and Circle", Royal Melbourne Institute of Technology, Melbourne; 1986 National Gallery of Victoria, Melbourne; 1987 Art and Aboriginality, Aspex Gallery, Portsmouth, UK; 1988 Australian Aboriginal Graphics from the Collection of the Flinders University Art Museum; 1989 Westpac Gallery, Melbourne; 1989 "Mythscapes", National Gallery of Victoria, Melbourne; 1989 Aboriginal Art, The Continuing Tradition, National Gallery of Australia, Canberra; 1991, The Painted Dream, Contemporary Aboriginal Paintings from the Tim and Vivien Johnson Collection, Auckland Art Gallery and Te Whare Taonga Aoteroa National Art Gallery, New Zealand; 1994, 2000 Araluen Arts Centre, Alice Springs; 1994 Yiribana Art Gallery of New South Wales, Sydney; 2000 "Twenty-five years and Beyond", Art Gallery of New South Wales (in association with Papunya Tula Artists), Sydney; 2001 "Pintupi, Alice Springs.